= Tofu sensei, kyou wa nani wo suruno? = Tofu sensei, what are you going to do today? =Uun. kinou wa ie de zutto nete ita kara, kyou wa nihongo demo oshieru yo. = Well, I slept the whole day yesterday so I guess I’ll teach Japanese today. Today’s guest teacher is Tofu Sensei. I love his fluffy hair. モフモフしたい! = Mofumofu shitai! = (Slang word) to feel something fluffy. = Minasan, hajimemashite! Tofu desu. = Nice to meet you everyone! I’m Tofu. 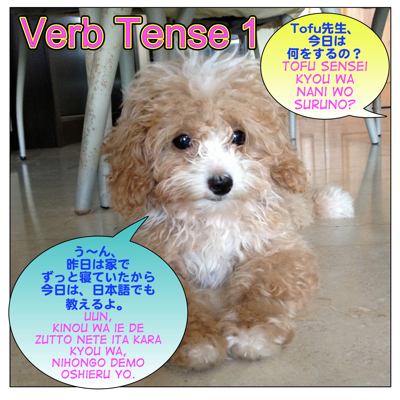 Today I would like to teach you Japanese verb tenses (present and future) comparing them with English verb tenses. When Japanese people start to study English verb tenses, they have trouble figuring out which tense to use. So you may have the same problem as well. You can not simply apply the logic of English verb tenses. I’ll show you what I’m talking about. “I teach Japanese on Maggie Sensei’s site.” in English. How would you say that in Japanese? = Watashi wa, Maggie Sensei no saito de nihongo wo oshieru/ oshiemasu. But they are not natural. You usually use 教える( = oshieru) / (polite) 教えます( = oshiemasu) , when you are talking about future and not what you do in general. = Watashi wa raigetsu kara Maggie Sensei no saito de nihongo wo oshieru / oshiemasu. = I will start teaching Japanese on Maggie Sensei’s site next month. = Kyou wa, Tofu ga Maggie Sensei no saito de nihongo wo oshieru/ oshiemasu. = Today Tofu will teach Japanese on Maggie Sensei’s site. As you see, when you use certain tense, it will be clearer with some time related words. “I (usually) teach Japanese on Maggie Sensei’s site.” in Japanese? = Watashi wa, Maggie sensei no saito de nihongo wo oshiete iru./ oshiete imasu. *I have been teaching Japanese on Maggie Sensei’s site. The verb tense changes depending on the context. We use the same verb form for different tenses. To help understand better, again, be sure to pay attention to the time related words or frequency words that you use in a sentence. *When you ask me what I have been doing. = Watsahi wa nananenkan, Maggie sensei no saito de nihongo wo oshiete imasu. = I have been teaching Japanese on Maggie Sensei’s site for seven years. *When you ask me what I do in general. = Ima, (shigoto wa) nani wo shite iru no / shiteimasu ka? = What do you do (for living) now? = Ima, Maggie sensei no saito de nihongo wo oshiete iru no./ oshiete imasu. = I teach Japanese on Maggie Sensei’s site. *When you ask me what I am doing in this moment. = Ima, nani wo shite iru no?/ shite imasu ka? = What are you doing right now? = Ima, Maggie sensei no saito de nihongo wo oshiete iru no / imasu. = I am now teaching Japanese on Maggie Sensei’s site right this moment. Note 1) : We often omit subjects in Japanese. Note 2) Both men and women use の suffix in a casual question but *の( = no) suffix in an affirmative sentence is a little feminine. = Asagohan wo taberu / tabemasu. = Maiasa, rokuji ni asagohan wo taberu./ tabemasu. = I eat breakfast at 6:00 every morning. Talking about the future, what you are going to do, your habitual actions, give instructions. = Ahita wa, rokuji ni asagohan wo taberu./ tabemasu. = I will/ I am going to eat breakfast at 6:00 tomorrow. = Asagohan wo tabete iru. / tabete imasu. = Ima, asagohan wo tabete iru. / tabeteimasu. = I am eating breakfast now. = Itsumo, rokuji ni asagohan wo tabete iru./ tabete imasu. = I always eat breakfast at 6:00. Talking about / describing present what has been doing/happening. = Rokuji kara zutto asagohan wo tabete iru. / tabete imasu. = I have been eating breakfast since 6:00. = Choushoku niwa itsumo nani wo taberu (no) / tabemasu ka? =What do you usually eat for breakfast? = Choushoku niwa itsumo nani wo tabete iru ( no) / tabete imasuka? = What do you usually eat for breakfast? You use both 〜る ( = ru) / ～ます( = masu) form and 〜ている ( = ~ te iru) / 〜ています( = teimasu) form. 〜ている ( = ~ te iru) / 〜ています ( = ~ te imasu) describe the continuous actions. (You have been doing something for certain period of time.) so you can describe the actions more vividly than 〜る( = ru)/〜ます( = masu) . * 時々( = tokidoki) sometimes, etc. = Maishuu kinyoubi ni doggufuudo wo kaini ikimasu./ kai ni itte imasul. = I go buy dog food every Friday. = Mainichi, gyuunyu wo ippon nomimasu / nonde imasu. = I drink one bottle of milk everyday. = Maiasa, jogingu wo shimasu / shiteimasu. = I jog every morning. = Ano suupaa de itsumo tabemono wo matomekai shimasu./ shite imasu. = I always bulk buy food at that super market. = Ano bangumi wa tokidoki, watashi mo mimasu./ mite imasu. = I sometimes watch that TV program. *When you are just talking about the present situation, 今 ( = ima), now, 現在 ( = genzai) present time, not the regular activity or routine, you don’t use 〜る( = ru) / ～ます ( = masu) form. Instead, you use 〜ている ( = ~ teiru) / 〜ています ( = ~ teimasu) form. = Ima, imouto wa watashi to onaji gakkou ni kayotte iru/ kayotte imasu. = My sister goes to the same school I do now. = Ima, doko ni sunde iru/ sunde imasuka? = Where do you live now? = Ima Oosaka ni sunde iru/ sunde imasu. = I live in Osaka now. = Ima watashi wa, ginkou de hataraite iru/ hataraite imasu. = I work for a bank now. = Ima watashi wa, ginkou de hataraku/ hatarakimasu. But if you are talking about near future, you can use 〜る ( = ru) / ～ます( = masu) form. = Ima, iku / ikimasu. = I’m coming now. / I am leaving now. Note : In this case the speaker is not leaving yet so 今 ( = ima) now, refers to future. = Nihonjin wa shushoku ni kome wo taberu. / tabemasu. = Japanese eat rice as their staple. = Uchi no neko wa ani ga yobu to shinda furi wo suru/ shimasu. = My cat plays dead when my older brother calls him / her. = Kono botan wo osu/ oshimasu. = Soshite fairu wo hozon suru/ hozon shimasu. = And then save the file. = Kono nuigurumi wa suicchi wo ireru to ugoku/ ugokimasu. = This stuffed animal moves when you turn on the switch. = Kono densha wa Yokohama ni tomaru/ tomarimasu. = This trains stops at Yokohama. = Kare wa nikagokugo wo hanasu / hanashimasu. = He speaks two languages. 6. When you talk about something habitual, daily routine, etc. you usually use 起きる ( = okiru) to get up, 開く ( = aku) to open, 出る ( = deru) with 〜る ( = ru) / ～ます ( = masu) form. = Itsumo nanji ni okiru? / okimasu ka? = What time do you usually get up? = Hachiji ni okiru / okimasu. = I get up at eight. = Dono deppato wa futsuu, juuji ni aku / akimasu. = Any department store usually open at ten. Note: If you say 開いている/開いています( = aite iru / aite imasu), it means the store is in the open state. = Eiga wa kuji ni hajimaru / hajimarimasu. = The movies starts at nine. Note: If you say　始まっている/始まっています( = hajimatte iru / hajimatte imasu), it means the movie has already started. You use 〜ている ( = ~ te iru) / 〜ています ( = teimasu) form. = Ame ga futte iru/ imasu. = Ima, nani wo yatte iru no? / yatte imasu ka? = Terebi wo mite iruyo. /mite imasu yo. = I am watching TV. = Kodomotachi wa ima, geimu de asonde iru. / asonde imasu. = The children are now playing a game. = Haha wa ima, nete iru/ nete imasu. = My mother is sleeping now. = Ima, kare to hanashiteiru tokoroda / tokoro desu. = I am now talking to him right now. = Ima, kare to hanashiteiru saichuu da./ saichuu desu. = Ashita wa tomodachi to nihongo no benkyou wo suru/ shimasu. = I am going to study Japanese with my friend tomorrow. = Tsugi no nichiyoubi ni aini Toukyou ni iku/ ikimasu. = I am going to see my boyfriend (him) next Sunday. = Ima kara iku / ikimasu. = I am going there now. = Ima, ie wo deru / demasu. = I am leaving my house now. = Ashita, denwa wo kakeru / kakemasu. = I will call you tomorrow. = Konya wa mina de nomini iku / ikimasu. = I will go out for a drink with everyone tonight. = Kyou wa ie ni kaerimasen. = I won’t go home today. = Rainen, nihon ni ryuugaku suru/ ryuugakushimasu. = I will study abroad in Japan next year. = Raiki wa motto ganbatte benkyou suru / benkyou shimasu. = I am going to (or I will) study harder next year. = Imouto wa rainen kara watashi to onaji gakkou ni kayou/ kayoimasu. = My sister will study at the same school as I go to. = Gogatsu kara doko ni sumuno? / sumi masu ka? = Where are you going to live from May? = Raigetsu kara Osaka ni sumu / sumimasu. = I will live in Osaka from next month. = Watashi wa, daigaku wo sotsugyou shitara ginkou de hataraku/ hatarakimasu. = I will work for a bank after graduating from university. (2) To stress your intention more, you can use つもり( = tsumori). = Rainen, indoneshia ni iku tsumori da/ tsumori desu. = I am going to (planning to) go to Indonesia next year. or use 〜う・〜おう ( =~ u / ~ ou) form when you are talking to yourself. = I should try harder! = Ashita wa Tofu ni ai ni ikou. = I will (try to) go see Tofu. (3) You use でしょう(=deshou) or だろう (=darou) when you forecast something or imagine what is going to happen in future. = Ashita wa, ii otenki ni naru deshou. = It is going to be a nice weather tomorrow. Note : You hear this sentence only in weather report. = Kotoshi wa keiki ga motto yoku naru darou. = The economy will be better this year. = Kono shigoto ga haittara motto seikatsu ga raku ninaru darou. = If I get this job, my life will be easier. You don’t useでしょう ( = deshou) or だろう ( = darou) when you talk about what you are going to do in the near future. = Watashi wa ashita, benkou wo surudarou / deshou. You mainly use them in a written form when you imagine what is going to happen in future. = Ano futari wa mou wakareru darou./ deshou. = Those two will probably break up soon. = Korekara tanoshii jinsei wo okuru koto darou / deshou. = You are going to have a fun life from now on. When you describe what you are going to do in future. = Kyou wa ie de zutto benkyou shiteiru./ shiteimasu. = I will be studying the whole day today. = Rainen no imagoro wa daigaku ni kayotte iru to omou./ omoimasu. = I think this time next year I will be going to the University. OK, that’s all for today. We will have another cute guest teacher and continue teaching past tense next week. = Minnawa, kyou wa nani wo shite asobu no? = What do you want to play today? Sorry. Just read your comment and the previous question. Hi Maggie-sensei, I would like to ask for this sentence 日本へ何度か行っていますか？, which of your explanations does it falls under? I suppose it is not progressive so that leaves ‘Talking about / describing present habitual actions or continuous actions’. Maggie, thank you for the great lesson! Thanks for the lesson, maggie-sensei! = Konshuu wa ie de zutto benkyou shiteiru./ shiteimasu. should it be a day or a week? Thank you for spotting the typo, Alina! You are am excellent teacher. Hello Sensei! Would you mind explaining to me the usage of Japanese verb stem form? I watched an anime and I heard they use the word tabe. Please help! “tabe”? I need more information of your question. You want to know how you conjugate a verb, “taberu”? Hmm, so you saw a verb, taberu, is used just “tabe”?? You don’t usually use just a verb stem. Please recheck the whole sentence. Yes yes! He was saying about dating a girl and mention about “Burger o tabe”. Can you enlighten me on this? I read somewhere that renyoukei form can be used on its own but more to literary and writing type. But some sites wrote that it can’t be used alone as well. OK, お+ verb stem = is a gentle command form. Note: It doesn’t work with all the verbs. Mizu wo onomi = Drink water. Maggie sensei, I would like to ask about 3 verbs: 来る, 行く and 思う. Your example 毎週金曜日にドッグフードを買いに行きます。/ 買いに行っています。translates as I go buy dog food every Friday. That means 来ている and 行っている are coming and going respectively, right? If I am not wrong, 来ている・行っている also means to come/go and then be there? In fact, I’ve seen this context being used much more like in drama. Correct me if I am wrong. For example, 先に行っています means I will go and be there first rather than I am going first. If I want to say “I think I want to…”, for Japanese, is it more natural to use …と思う or …と思ってる? I see both used equally much so I am not sure what is the subtle difference. Or are they exactly like English where we say “I think I want to go Japan” versus “I am thinking of going to Japan”. What’s the difference between “毎日、ご飯を食べる”　and “毎日、ご飯を食べている”? (since 毎日 is a time phrase so should we use ている?) or does the second sentence imply that before I don’t eat breakfast everyday but now I do? Also, in the lesson, you said: “子供達は今、ゲームで遊んでいる”. Why is it not 子供達は今、ゲーム”を”遊んでいる? Sorry for the long questions! They both mean the same and describes the daily habitual action. As I explained in the lesson, you can describe the actions with 〜ている ( = ~ te iru) / 〜ています ( = ~ te imasu) more vividly than 〜る(=ru)/〜ます(=masu) . So you don’t use an object marker,を. I am just wondering is it possible to just take the “る” form of a verb and add a noun to make it a new noun, because I just heard the word “帰る場所”? But what I have learned is always to add こと after the verb to make a noun. I have also noticed that some verbs can just take the “ます” stem to form a noun such as たべもの? Does it work for all verbs as well? This 帰る is not a noun. It is a very that modifies a noun. It is not just る form. You can use it with any tense. = a person who speaks Japanese. = A book that I read a long time ago. = A friend that I fought with. Q: I have also noticed that some verbs can just take the “ます” stem to form a noun such as たべもの? Does it work for all verbs as well? No, not all the verbs. It is very limited. So I was looking up the usages of ~ている and stumbled upon this awesome website! Thank you very much. I still don’t understand what is the distinctive difference between the habits/facts/general actions for which we can use both ～る/う and ~ている, and for those we can only use ～る/う? You said we only use ～る/う form “When you talk about something in general or about something that happens all the time.” But is not this the case for all habitual actions? What is the difference between the cat example (うちの猫は兄が呼ぶと死んだふりをする/ します) and going to a university everyday, for example? Why could not we use ～ている form for the cat example? But When you talk about something in general or about something that happens all the time, you use る・う form. But if you add certain time related word, you use ている form. Sensei, I’m just wondering whether ～ている in the two sentences below indicates a resultative state? Hello teacher. Why isn’t 寝ていた here translated “I was sleeping”? Also, how does でも work? I don’t see its translation here. Ah, OK, Maybe you can’t see the function of でも from the translation. Can you tell the difference in the following sentences? While 1) is very specific. →I will teach Japanese. 2) is more vague. →I will do something like teaching Japanese. →I guess I will teach Japanese or something like that. Why thank you. I have another question. How do you make passive voice? For instance: Her car is parked in front of the department store. This conversation could be tapped. = Kanojo no kuruma wa depaato no mae ni chuusha sareta/ saremashita. = Kanojo wa depaato no mae ni chuusha shita./chuusha shimashita. The first, so the～する can be used to make passive form instead of ～される ? The second, I have seen people using ～ている for passive form. So, could you shed any light on this subject? The passive form of　する is される. What you have seen is されている= has been done. ありがとう Magie Sensei！I look forward to your next lesson. Isn’t no 1 not natural if using 〜る? But when you talk about what you do as a job, ている is more natural. I see when you say テレビを観ている。You use the kanji 観 what is the difference between this kanji and 見? Could you use 見 in it’s place? You may also want to know…. What a coincidence! I’m learning present + future tense in my Japanese classes now too! Hi Jane! Yes, what a coincidence, huh? Sorry, I accidentally hit a keyboard shortcut that caused the message to be submitted before I was done typing. Sorry!!! I must have mixed them up. The realy Nemo-sensei will teach next week. I will fix the name but it will take several hours. Please wait. Your basic lessons are so helpful I always learn something new reading them. Thanks! Shouldn’t the romaji here be “Kyou wa ie de zutto benkyou shiteimasu”? Thank you for spotting the mistake. I fixed it. I will release verb tense Part 2 next week. Please come back to study.